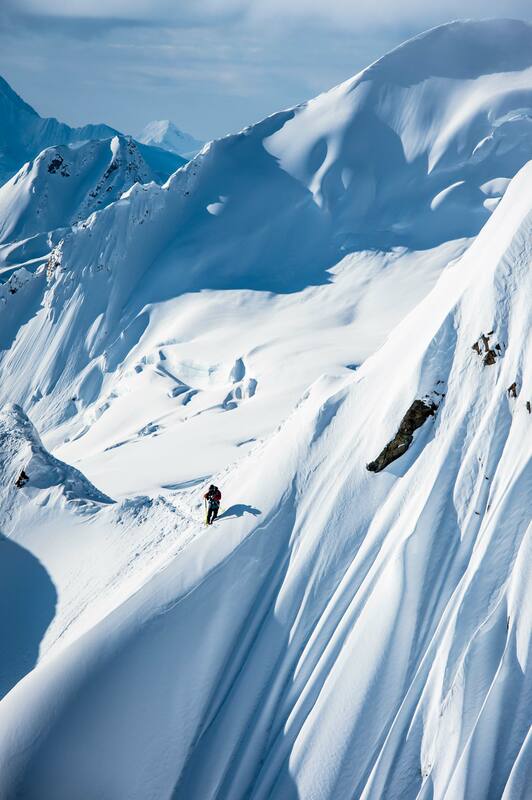 During the filming of the Passenger, Tom Leitner, team member of Legs of Steel, had his first experience of Alaska, the land of spines where the powder sticks to the vertical surfaces and where every skier has a big wide dream of taking his skis. But to pass from a fantasy to reality, one must adjust to a unusual universe where the landmarks are topsy-turvy and the risks are part of the game. Between apprehension and ecstasy, Tom gives us his impressions of an intense journey where group solidarity plays a key role and allows the transformation of the first disappointments into decisive success. “Passenger” can be seen as a (provisional) climax in the work of Legs Of Steel. In my view it is one of the few European productions that has reached an international standard, and doesn’t have to hide, in any way, from the major players in the industry. 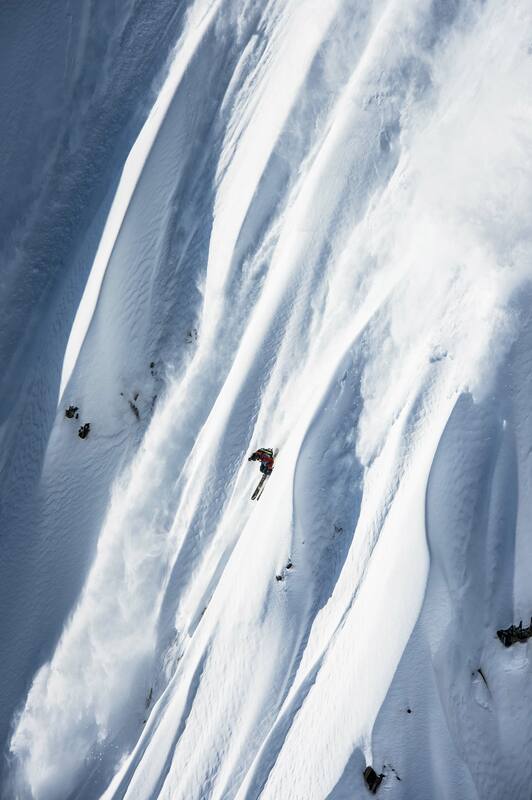 The glossy pictures of seemingly high production costs, with all the international stars, do sometimes make one forget that it is the blood, sweat and tears of all those involved that make a ski film, on that level, possible. Many are also surprised at how little the success of the shots can be calculated beforehand and how much ultimately depends on human encounters, friendships and last but not least, luck. This applies to Alaska in particular: from the financial risk to the risk of injury for the riders, from weather conditions to the risk of avalanches, from snow quality to the “politics” on the ground: there are multiple factors, making the success of such a costly trip, for a few Austro-German rookies, rather improbable. Nevertheless, in the summer of 2014 the decision was taken to put the cards on the table and plan an intrepid trip to Haines, Alaska. The first year of filming for “Passenger” was over and the winter 2013/14 gave the hope of being optimistic about the coming season, the second year of our project: how could the snow gods, after having put winter on hold for a complete season in the northern European Alps, not reward us with a snowfall of epic proportions? I saw the trip to Alaska as the icing on the cake, the crowning of the record winter to come – well, we all know how that turned out in the Alps. So, in the end it came down to a grande finale, a crescendo of winter without the guarantee of a final redemption – High Noon in Alaska. What I really want to say is that, by then, it had just been a really rubbish season…. and the pressure on the success of the trip was enormous. Many of our attempts to ski proper lines in the Alps had either failed due to general lack of snow, been thwarted by sudden temperature explosions or, had appeared too risky due to the precarious avalanche situation. In addition, the entire West Coast of the United States and Canada appeared fully drained, which was mirrored in the decision of the all seemingly reputable film crews to choose Alaska as their promised land: it seemed as if the micro climate of Haines, was one of the few regions world wide that had been blessed with snowfall. So we were both shocked and motivated at the same time by the number of well-known film crews who had heard of the conditions and had, more or less spontaneously, pitched their tents on location. Somewhat intimidated but full of expectations were Tobi Tritscher, Fabi Lentsch, our filmmaker Andre Nutini and myself, who arrived as the first LOS crew ambassadors. The first bluebird day, according to the weather forecast, was announced within a few hours, already and the nervousness, mingling with the jet-lag, resulted in a strange blend of mixed emotions. So, equipment was weighed in, avalanche equipment checked and final instructions in and around the helicopter were given. Already, the next day was going giving us the opportunity to meet Alaska in its purest form. After a restless night, between secret hopes that it might be cloudy the next day and vivid dreams of steep slopes strewn with Spines, we finally packed our things for an early start. The hustle and bustle and the race between the crews to get the first helicopter, hit us like a bucket of cold water. Rumours, conspiracy theories and other stress-related symptoms mingled with the smell of kerosene and softened mud, a touch that can serve as a trigger for romantic daydreams but only in retrospect. On that day three small Europeans were quick to realise that you have to be on the ball here, if, in the end, you do not want to fly home with empty hands and an empty wallet: either you somehow succeed in convincing them to get that first heli drop to a certain zone or you will be the second I line / loser of the day and spend precious heli time scanning and searching for lines, which might or might not work out. The outcome didn’t seem to be in our own hands, whereas, seemingly, everybody else understood the functions of heli-base-politics way better than us. We were relying totally on our guide and his judgement. Only later did we realise that he’s an absolute boss. So, anyway, we were not yet on the ball. For our first lines that we were filming, little went according to plan and we had to take a few serious beatings. After some hesitation, reflection and flying around we found a perfect slope, covered with spines and of a steepness that is unimaginable in the Alps, with this kind of snow. The only drawback, and probably also the reason why it had not so far been a first descent: there was no outrun. Wide gaping crevasses forced us to plan our lines so that we were able to escape with a sharp left turn out of the danger zone at the end. This turned out to be more problematical than it seemed; all three of us were given our first acquaintance with the incredible power which builds up in such steepness, coupled with the sluff. Three Lines, three hard falls, no serious injuries, all skis miraculously retrievable. The only collateral damage: a helmet camera and a some sore muscles. Welcome to Alaska! And our confidence was on the ground. This moment would be a turning point, it was clear to all of us. Which way it would go, nobody knew. 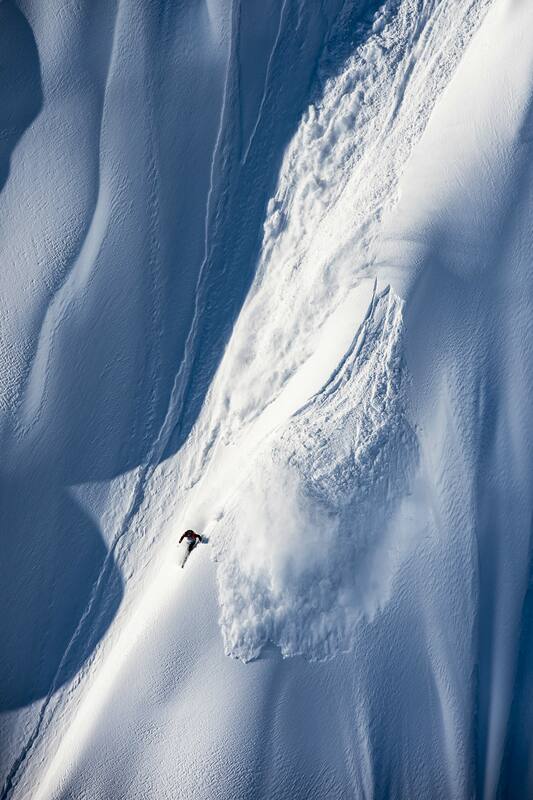 Now to reveal what made the constellation so special within the ski-film industry: the opportunity to work with the best friends, with people who you can trust absolutely, and give you the opportunity to be yourself, to play without taking on a role. Only in this way was it possible to process the first setbacks, to take the flayed limbs with humour and to rationalise the importance of the whole thing. Together, we succeeded in summoning the fun of skiing and maintaining a positive view on things. 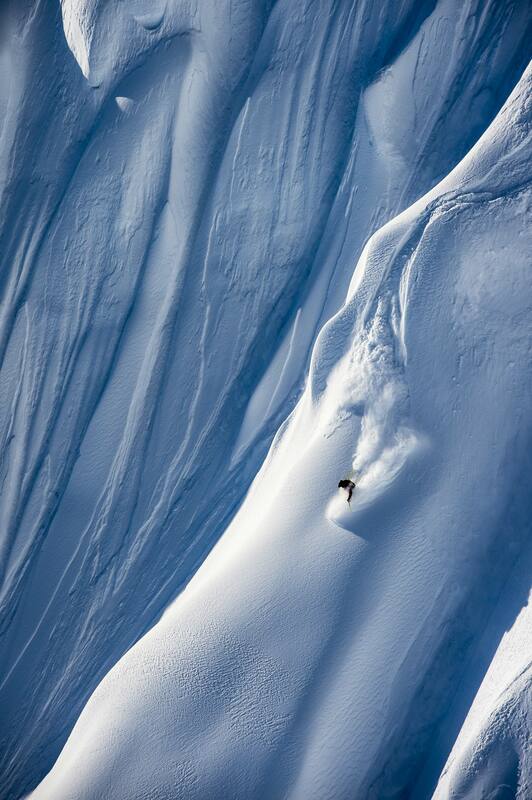 We were given the honour of naming the face of our putative first descent, and we decided to call it “Legs Of Jelly”. In the following down days we grew together and formed a team in the best sense. 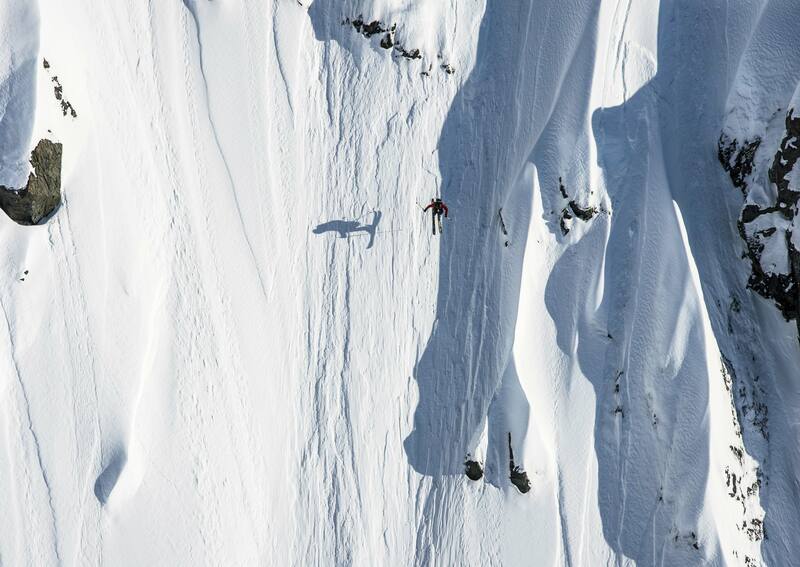 Not only the skiers, but also our filmmakers Andre Nutini and David Peacock contributed to the feeling that we all acted in concert, egos were scaled down and a true spirit of what free-skiing can be, was upheld. It was those days in which the foundation stone was laid for the extremely successful progression of the trip, in which a total of seven riders took home a number of lines – a feat that would not be possible had we not worked as a crew. Our cameramen absolutely killed it behind the cameras and our pilot did not hesitate to fly some hairy manoeuvres to get us on top of our lines or to deliver the best film angles. Last but not least, it turned out that our guide, Timothy Thomas, was an absolute gangster, helping us get to our lines, to be the first to leave the heli base and cheering us up whenever needed. Only through this blend of friendship and hard work did our “Passenger” segment in Alaska turn out the way it did. black crows protect themselves with a light padded jacket to temper the ardour of the cold.